What’s new in Yellowfin’s Business Intelligence solution? Subtabs! With the next version of Yellowfin’s Business Intelligence (BI) solution – Yellowfin 6.3 – due out at the end of next month, we’ve been working hard to put the finishing touches on the release’s new features and enhancements. One long-requested addition that will be pleasingly making its way into our 6.3 release, are dashboard subtabs. For those unfamiliar with Yellowfin’s tech lingo, a subtab is essentially a group of reports within a dashboard tab. Alternatively, subtabs can be thought of as a tab within a tab. So how will dashboard subtabs make your life, as a Yellowfin user, easier? Well, subtabs allow you to share filters from a dashboard across many reports. Reports are only run when a subtab is selected, therefore allowing for quicker load times when reports are broken-up across subtabs. 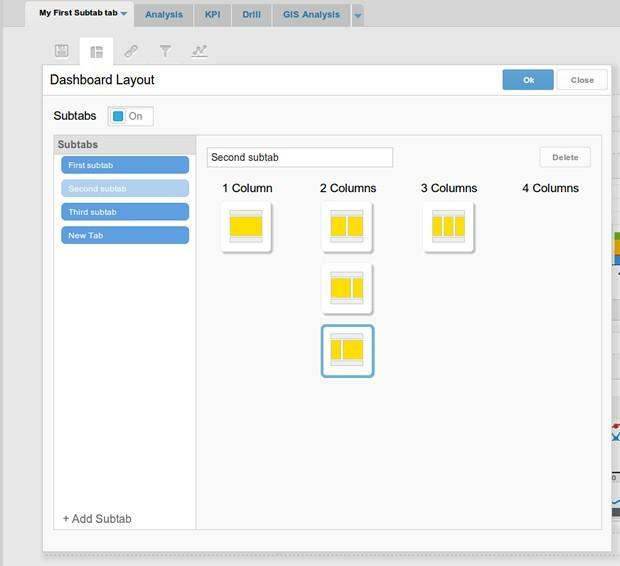 In Yellowfin 6.3, you’ll be able to activate the new subtab feature while editing a dashboard by turning subtabs ‘on’, in the new dashboard layout panel. New subtabs can be simply added via the ’add subtab’ option at the bottom of the panel. Subtabs will be able to be renamed, have different column layouts and be reordered as well as removed. When all subtabs – bar one – are removed, the dashboard will hide the subtab menu and simply display the last remaining subtab. You’ll also be able to enable subtabs on your existing dashboard tabs in Yellowfin. Subtabs are set-up exactly like regular tabs are now, where reports are dragged from the report list onto the page. Keep a lookout for our official 6.3 launch Webinar, coming in the final week of May 2013.